As manufacturers transition into data and digitally-driven business models, there are significant implications for intellectual property (IP). Dr Frank Tietze, Head of the Innovation & Intellectual Property Management research group at the IfM, considers five key challenges, and some strategies to address them. In the story of the emerging digital economy, disruptors are bringing new ideas into the manufacturing industry with the potential to transform existing and discover novel ways of working. The problem for the incumbent manufacturers in many industries is not only that the technology has evolved and become increasingly complex, but also that they may not own the intellectual property (IP) that new digital technologies are built upon. In this fast-changing digital world, they face a fundamental problem: their power base is built on traditional business models and ideas that are in danger of becoming outdated and diminished. Many firms have built huge value into intellectual property portfolios for those traditional models, which are in danger of being displaced by disruptive new approaches. The automotive sector is a case in point. It is likely that in a decade cars will mostly be powered by electricity and electric engines, and that these vehicles will be more ‘intelligent’, if not autonomous. Such changes are enticing different kinds of companies into the sector, including established digital giants, posing a whole new challenge to traditional automotive manufacturers. These transformations in automotive come with an enormous IP risk for incumbents. Two significant risks arise: First, the firms that dominate the automotive sector of the future are likely to be those that actually own the IP for the emerging technologies, or key elements of them. Knowing how to use them is insufficient. If this know-how belongs to digital giants entering the sector, it could mean that traditional automotive manufacturers need to forge partnerships in order to survive, and end up paying for access to the technology. Second, those large automotive companies that have dominated the sector for years have built patent portfolios around the technologies relevant for the current (or previous) business model. Those portfolios are in danger of becoming seriously devalued. There is increasing value held in the large volumes of data being accumulated within companies. In addition to product sales data, customer records, component prices, supply chain information or market statistics, there are commercially sensitive electronic items such as CAD drawings. Such data presents an IP risk in terms of potential breaches of cyber security. Of particular value are proprietary cloud-based algorithms and large scale training data repositories collected over time through Internet of Things (IoT) devices. Artificial Intelligence (AI) algorithms increase in value as they gather and use training data to improve their accuracy. In a digital economy, such proprietary and extensively-trained AI algorithms can be highly valuable, potentially even contributing a significant share of a firm’s value. Consequently, companies need to pay close attention to protecting and exploiting this value. In the past, IP security was focused on retaining knowledge held by people within the workforce, using tactics like contractual clauses to prevent people leaving the company and joining competitors. While this may in many cases still be relevant, the focus is shifting towards cyber security for protecting data. Additionally, to boost the value derived from data, companies will find it increasingly attractive to consider licensing out their data. Digital rights management then becomes crucial. They could take a conservative approach to this, working restrictively with a small number of parties within their supply chain or ecosystem, or take a more expansive approach which could even extend to licensing data to competitors. Digital ledger technologies, such as blockchain, are likely to play an important role for protecting but also the commercializing data and IP. It is vital to understand the power of IP portfolios. 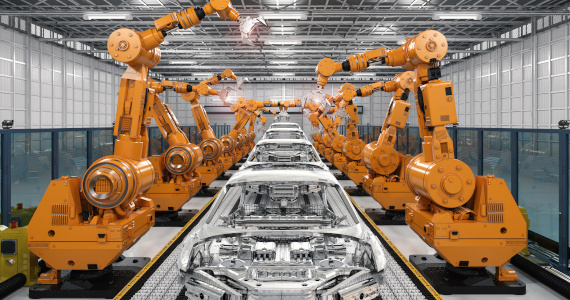 In our example of the automotive sector, electronics-based technologies relevant for future vehicle manufacturing could include the IoT, AI, battery management and drone control. Successful companies will be those that understand how to develop large and strategically-driven IP portfolios covering multiple relevant, emerging and converging technologies. They will also need to have (or to access) the complementary knowledge and skills in order to find and develop favourable trajectories that lock-out competitors. If new entrants such as digital giants can do this successfully, and early, they could gain a competitive advantage against big incumbents that may find it difficult, if not impossible, to catch up and close the gap. Given the complex and fragmented patent landscape of the digital economy (with IP ownership distributed across many firms), it will be difficult for companies to own all the IP necessary for manufacturing intelligent devices. As a result, companies will need to consider how best to acquire usage rights from IP owners. Often they will need to sign in-licensing contracts to achieve compliance before product launch and to avoid infringements. On the flip side, the proprietary technologies which manufacturers own might be of value to other companies who would be willing to pay for accessing those technologies. However, setting up out-licensing services requires specific and scarce skills and capabilities, which companies will need to invest in if they wish to pursue this opportunity. Manufacturing firms develop software components built into digital products internally, but may also utilize existing ‘free’ and open source software obtained from leading development platforms such as Github. What may not be immediately apparent are the total cost implications of open source software: often use is ‘free’ only under certain conditions, such as requiring the user to make all software developed on an open source component freely available to the community. Manufacturing firms will have to understand and master the complexities, differences and requirements of the numerous licensing types for compliance reasons. Already some large consulting companies have found a good business model providing compliance services to companies using open source software, for substantial fees. We are currently seeing a tightening of legislation around particularly important proprietary company knowledge typically referred to as trade secret, which again could include well-trained AI algorithms. This will require firms to identify and separately treat, protect and enforce their most valuable know-how / data (trade secrets) from their generic data (such as customer records). In order to be well-positioned and prepared to succeed in the digital economy, there are three central pillars for manufacturing firms to consider for managing IP. The first is about people. Firms will need to possess or access the IP awareness and IP management capabilities necessary to succeed in the digital economy. The second concerns business objectives and structures. Any good and forward-looking IP strategy needs to be aligned with organisational structures and business objectives. This may require consolidation of existing IP management, which is often scattered across multiple departments: for instance, while technologies may be managed within patent departments, brands may be dealt with by marketing departments, trademarks by legal teams, contracts by a purchasing department, and software and data within IT. The third is strategy. Organisations need to develop their own integrated digital IP strategy. 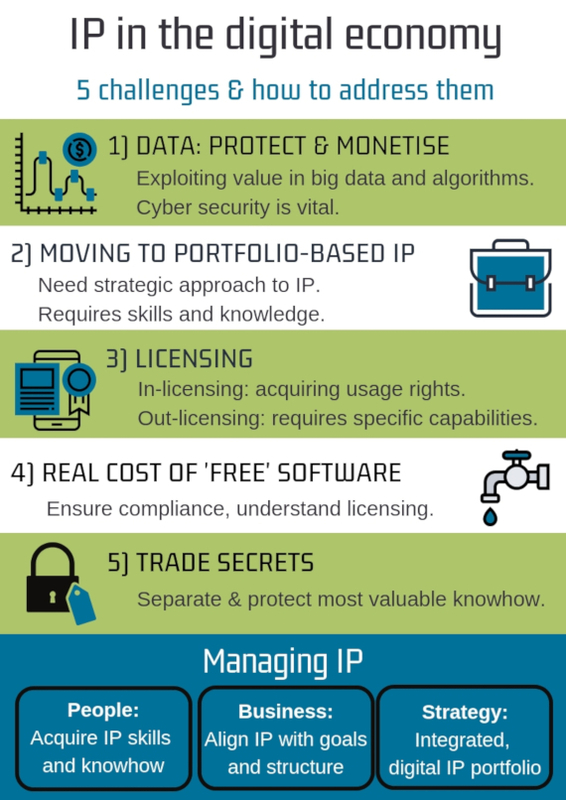 This is likely to be substantially different from a traditional IP strategy: it needs to consider the different types of IP, including software and data as well as the firm’s approach to in- and out-licensing, and involve a portfolio approach in which multiple IP assets complement one another. Ultimately, the success of manufacturers in the digital economy is likely to hinge on having the know-how to develop an integrated portfolio-based IP strategy, and to align it with broader organisational goals and structures.